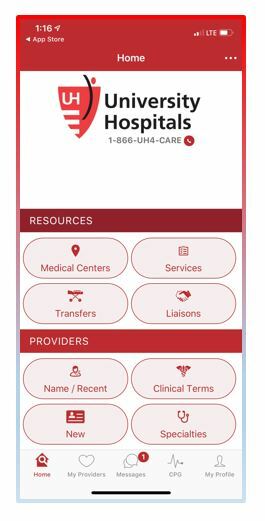 The UH Provider mobile app, available for both Apple and Android smartphones and devices, opens up the wealth of clinical expertise available at University Hospitals medical centers and health centers throughout Northeast Ohio. The app allows referring clinicians to quickly and efficiently locate UH physicians by name and/or specialty. It also provides information about our UH Urgent Care locations and phone contact numbers for direct admission to UH hospitals (by site). Identify UH providers who speak a particular language, moving them to the top of your search results, if you wish.